Now in a completely revised third edition, this classic book shows how to create winning appeals that will realize the full potential of direct mail and online fundraising. 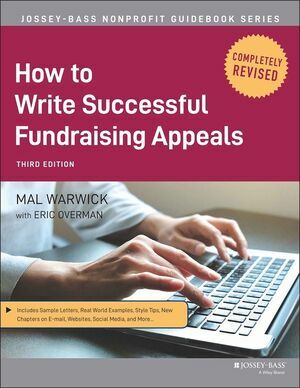 Written by fundraising guru Mal Warwick, with assistance from Eric Overman, this comprehensive resource gives nonprofit fundraising staff the information needed to write compelling fundraising appeals for any medium. If you follow Warwick's guidelines, your direct mail and online fundraising campaigns will produce better results, year after year. Written in an easy-to-read style, the book is filled with practical techniques, proven approaches, and illustrative examples of both successful and unsuccessful appeals based on the authors' wealth of experience fundraising for hundreds of nonprofits. Step-by-step and appeal by appeal, the book shows how to navigate the fundraising appeal process with ease. To meet the demands of today's socially connected donors, this new edition explains how to mesh today's online technologies with direct mail to produce optimal fundraising results. You'll learn how to use e-mail, websites, Facebook, Twitter, and mobile technology to recruit more donors and raise more money. The book includes current research on timely topics such as online vs. offline behavior, online giving statistics, demographics, and best practices in integrated fundraising. If you're a nonprofit professional eager to master the latest methods in fundraising, or simply need to write direct mail appeals for your organization, How to Write Successful Fundraising Appeals will help you hone your skills and create appeals that will hit the mark every time. Eric Overman is vice president of digital strategy at Donordigital. Prior to joining Donordigital, Eric was vice president of digital strategy at Grizzard Communications.